Today one of our customer called that he has all exchange 2003 databases down and he cannot mount them. After couple seconds of googling I found following site http://technet.microsoft.com/en-us/library/bb266925(v=exchg.80).aspx where Microsoft states that names for log files in Exchange have limits. Until today I thought Exchange would delete all log files when full backup is done and Exchange would start log files from zero. But I was wrong, Exchange continues numbering log files until it reaches its limits. And this was the cause. 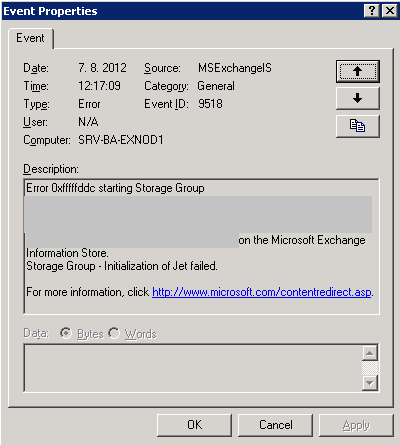 We used instruction mentioned in article using Microsoft Exchange Troubleshooting Assistant. I dind’t find any event on server mentioning that I reached, for example, 90% of file name space. This is nice note we need to know when Exchange runs for a long time. This limits are also for Exchange 2007, but limit is higher. I have no idea how it’s in Exchange 2010.